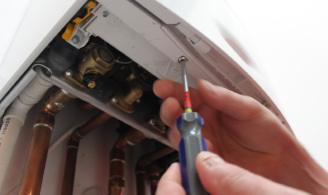 An annual service from Gas Water Heating (Servicing) Ltd. not only keeps your fuel costs down, but the appliance is checked and tested for immediate or foreseeable faults that may cause an issue in the future. These can then be rectified, meaning your boiler and heating system doesn't let you down. With Gas Water Heating (Servicing) Ltd., a temperamental heating system can be rectified, and as many faults are usually attributed to lack of maintenance, regular servicing means your boiler will be reliable and cost effective. As a company we follow industry best practices and are fully competent in installation fault finding, maintenance, repair, power and chemical flushing to British Standards with a certificate issued. 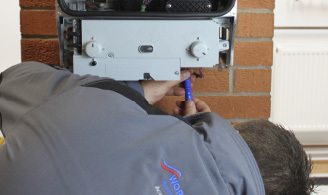 If you are unfortunate enough to have a problem boiler/ heating or radiator we have a range of diagnostic methods that can pin point the affected area. We are the only local company that offers thermal imaging of your system and radiators, so you the customer can see the actual performance before and after the work is carried out to resolve any issues. There is an example of thermal imaging lower down the page. Gas Water Heating (Servicing) Ltd. offer a full system flush BS7593 with certificate and can fit new filters and chemically treat and balance your system, which will resolve problems, giving you many years of hassle free hot water and central heating. A powerflush is simply a process that gives your central heating system a thorough internal clean and usually improves the central heating system's performances which can lead to lower gas bills. Over time, some heating systems may experience poor circulation resulting in lukewarm radiators, poor hot water, increased noise and sludge build up. By 'powerflushing' your heating system, sludge and built up residue will be removed via inline magnetic filtration, making your system work more efficiently.